The School of Science and Technology hosted a mentorship forum for female students in its programs on Thursday, February 28 at the Freida Brown Student Center. The forum was aimed at engaging women in technology and providing them with support through exposing them to initiatives that enhance their career development. The forum discussions were led by alumna Joylene Kirui (Applied Computer Technology, 2016), a Principal Cyber Security Assurance Officer at Safaricom, Mercy Wamalwa (Applied Computer Technology, 2016), Analyst-Risk Advisor at Deloitte East Africa, and Mr. Anthony Kiplimo, Developer Relations Lead at Africa’s Talking. The three speakers guided their audience through a discussion on the essential skills that every IT student needs to acquire before graduation, the current market needs for computing experts in the Kenyan and global tech ecosystem, as well as how to build a code portfolio –integral to securing a post-graduation position. 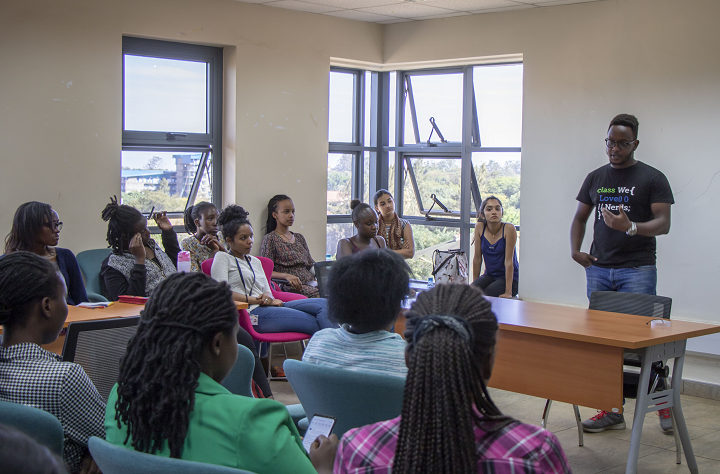 Ms. Kirui and Ms. Wamalwa expounded on their post USIU-Africa-experience strongly urging the assembled students to build an online portfolio on content sharing sites such as Github, since a resume was insufficient in demonstrating technological ability. The speakers emphasized that IT industry careers were still lucrative and such skillsets in demand around the globe, though they noted that women were still deploringly under-represented in the STEM fields especially in information technology. This revelation reflected current studies that suggest women make up only 20% of the IT workforce, thus underscoring new initiatives by the Department of Computing to, according to the Departmental Chair Dr. Patrick Wamuyu to “…encourage participation and improve retention of female students enrolled in our programs”.